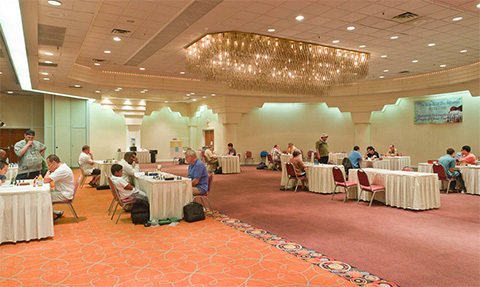 The Continental Chess Association went international with its road act to the Bahamas. Not even a turbulent stormy hurricane season could stop this tournament from being a success. 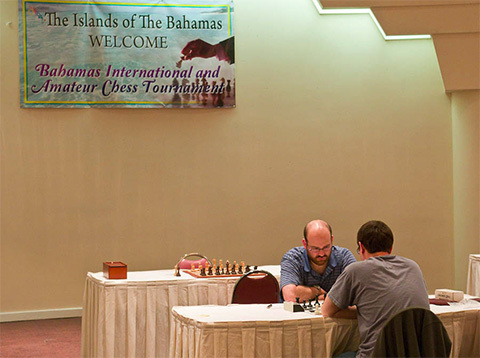 The Bahamas International & Amateur came together as a joint initiative between the CCA and the Bahamas Chess Federation. Yan Lyansky was the key contact and made an official announcement at the World Open in July. The event was held from October 24-28, 2012 at the Wyndham Nassau Resort & Crystal Palace Casino in the capitol of Nassau. Eighteen players registered in the Masters section, but what the tournament lacked in numbers made up for it by its sheer strength. Touting five Grandmasters, norm opportunities were on the line and fierce play was expected. The conditions were spacious, but from the looks of the room, many were deterred by Hurricane Sandy. Bahamas’ strongest tournament ever with five Grandmasters! GM Josh Friedel was in that number. Beautiful conditions, but Hurricane Sandy prevented a more dense crowd. Swiss Open ironman Alexander Shabalov came out on top with 6.5/9 pocketing $2000. Unfortunately, the tournament had no rules on draws and there a high number of draws played… including many lasting 15 moves or less. 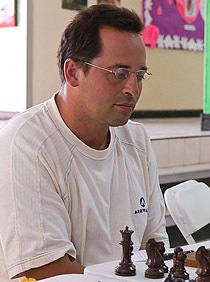 Alexander Goldin, who rarely plays these days, got 2nd place with 6/9. IM Leonid Gerzhoy and Yaacov Nororwitz got 3rd-4th with Norowitz getting an IM norm on 5.5/9. Erik Santarius also scored an IM norm with 5/9. The less-heralded Amateur section was won by Jingle Kho and host Yan Lyansky with 5/6. Many times National Champion Franklyn Gibson was 3rd.